During the years 2008 to the beginning of 2011 I wrote a number of programs that might (or might not) be useful to others, so why not sharing them? Many of them were inspired by the experiences I made with UNIX shell programming. 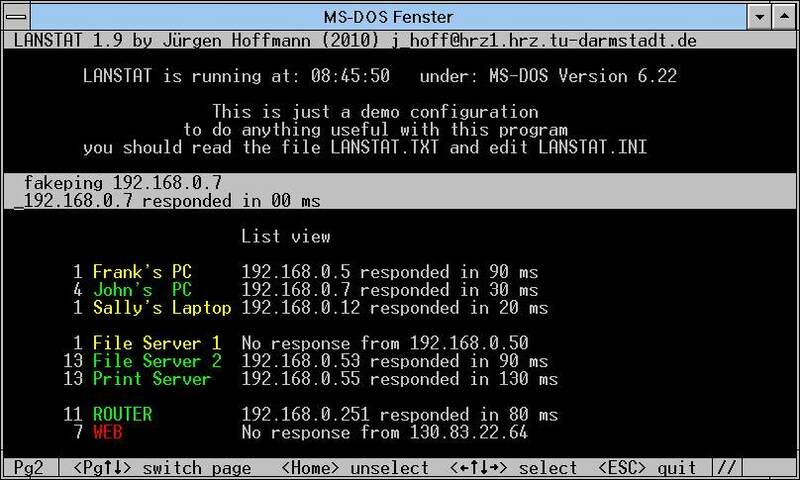 But (MS-)DOS is not UNIX and it is not always useful to do a one-to-one port of an existing UNIX program to DOS. The programs and utilities offered here for download were all re-written from scratch, considering the capabilities and limitations of true 16-bit (MS-)DOS. 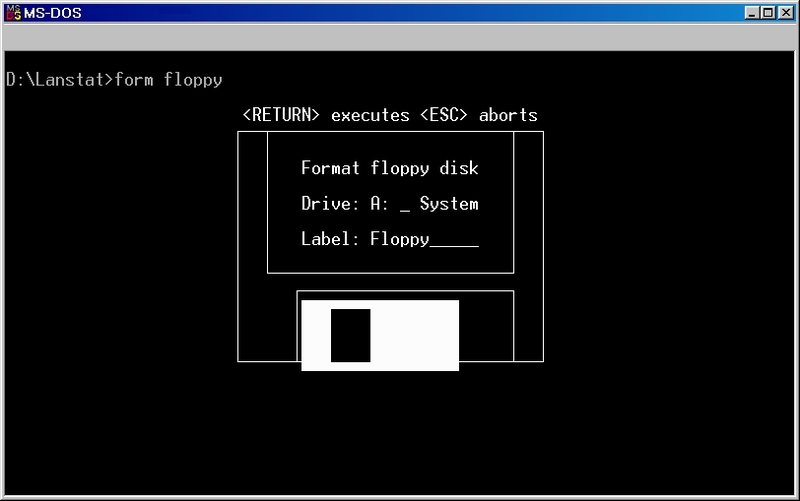 Most of them were developed under Borland C++, version 3.1 on an old computer with a 486 processor. They do not require 32-bit support or any kind of DOS extender software. As far as networking is involved they do however require a packet driver. 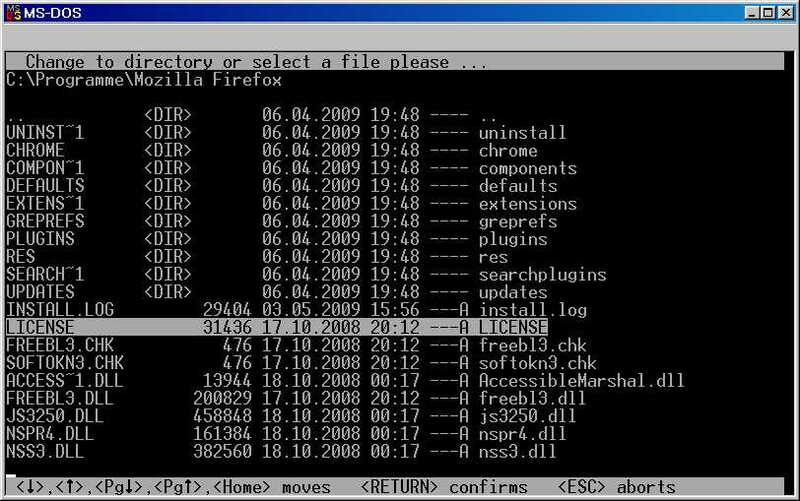 The archive DOSUTILS.ZIP is a collection of seventeen small utilities which are most useful in batch procedures even though most of them can also be used from the command line. One of them allows to do (32-bit) integer calculations which can not only be used for numeric loop counters but for many other purposes as well. Another one allows to cut arbitrary parts from the output of other programs and store them in environment variables. And a third one provides a user menu and directory browser. But why don't you just look and try yourself? Detailed descriptions of the individual programs can be found in the files DOSUTILS.TXT and FORM.TXT in the archive. 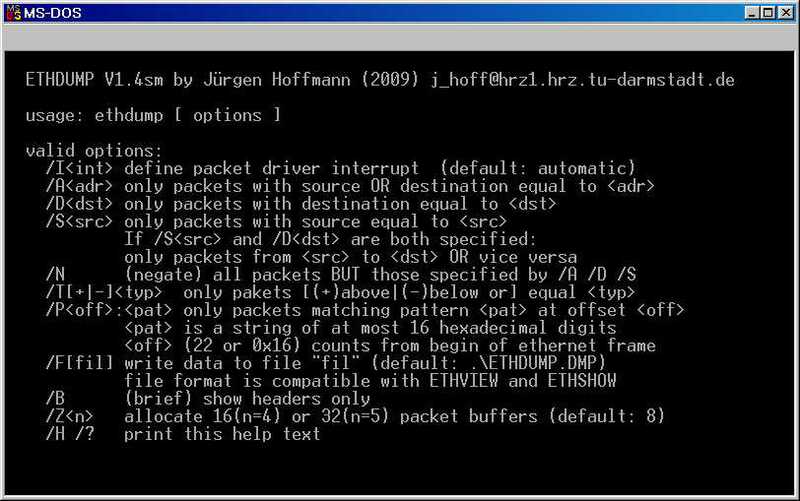 The archive ETHTOOLS.ZIP is a collection of seven programs for ethernet network analysis. They require an ethernet card (of course) and a packet driver, but no further configuration. A description can be found in the file ETHTOOLS.TXT in the archive. In addition each program has a built-in help function which can be accessed by the command line switches /h or /? 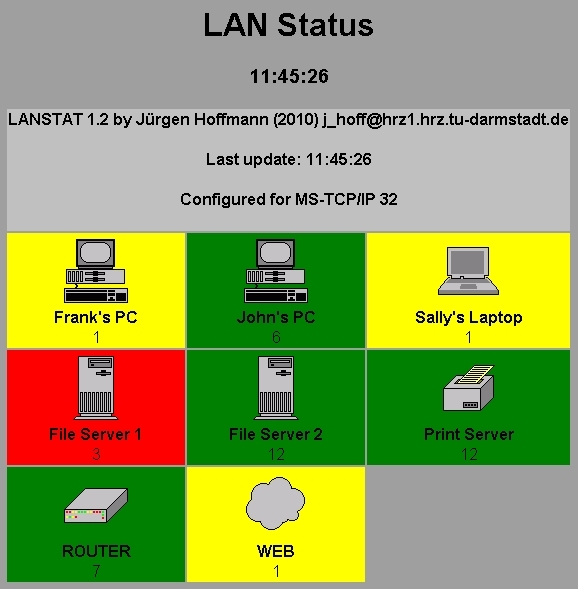 LANSTAT (LAN STATus) is a LAN supervisor, a program that regularly polls the nodes of a local area network to check their accessability and constantly displays the status of the LAN in a clearly arranged tabular manner. The trick is, that LANSTAT doesn't do any network access by itself, rather it invokes external programs (like, e.g., ping) for that purpose. This approach does not only keep the program very compact, it also makes it independent of the underlaying network stack. Therefore LANSTAT can run under virtually any type and brand of networking software. 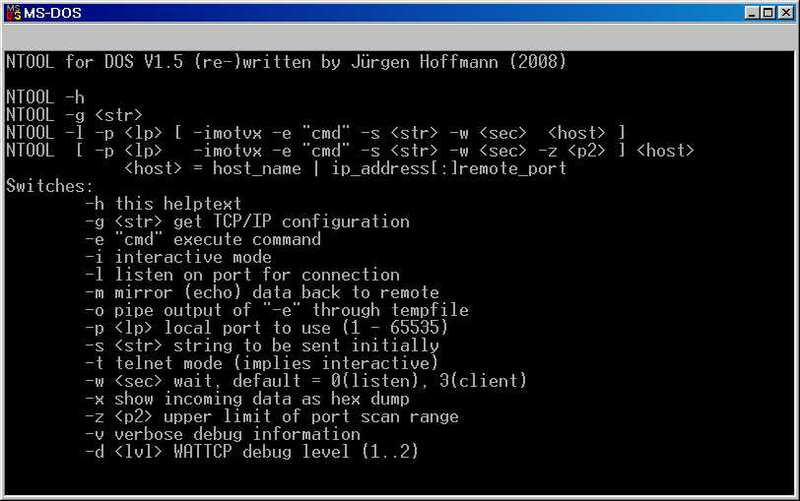 NTOOL is an incarnation of the program netcat which is also known as the "swiss army knife" of TCP/IP networking. See the file NTOOL.TXT inside the archive. It further describes the program and gives a number of examples of how it can be used. RMENU is "kind of" a telnet server for DOS. 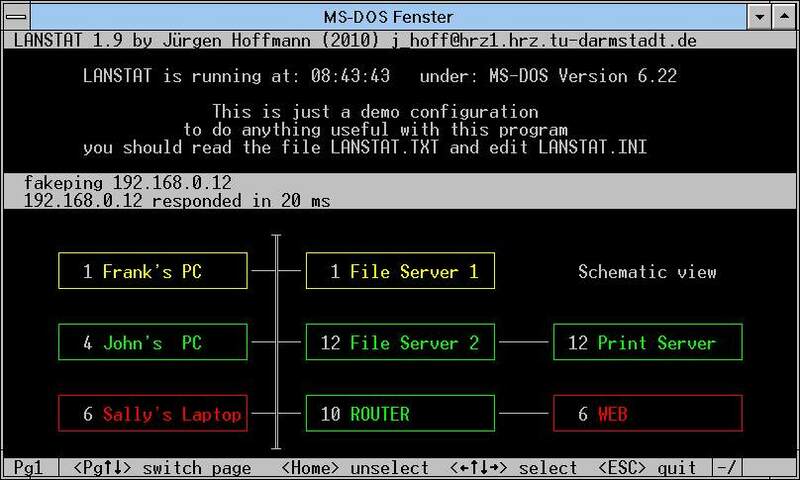 Of course it cannot turn (MS-)DOS into a multiuser system, therefore only one connection is accepted at any time, but it can be used to remotely control a computer runnig DOS via telnet. Unlike one might expect, it doesn't provide a command prompt, at least not by default, rather it offers the remote user a menu from which he/she can pick an item. What kind of actions the various menu items perform, is controlled by a configuration file. Although the archive comes with a demo-configuration file which allows to play around, it is absolutely necessary for a serious application to carefully set-up this configuration file according to the individual needs. The file RMENU.DOC which can also be found in the archive tells you the details. Screenshot #1: The help screen of the RPN calculator RPN.COM. 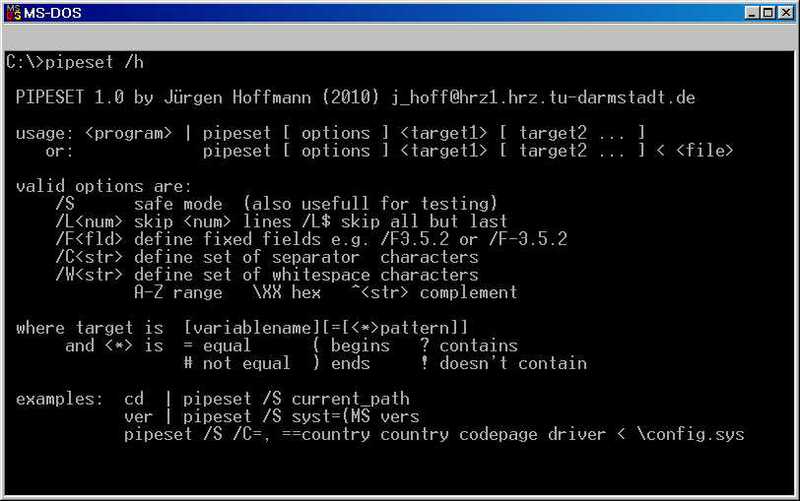 Screenshot #2: The help screen of the program to set environment variables PIPESET.COM. Screenshot #3: The menu program and directory browser SELECT.COM. Screenshot #4: One example of the capabilities of FORM. Screenshot #5: Another example of the capabilities of FORM. 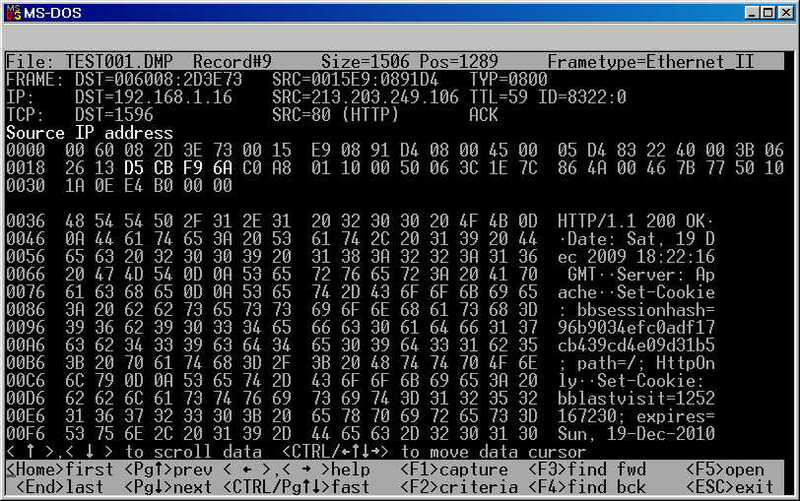 Screenshot #6: The help screen of the ethernet capturing program ETHDUMP.EXE. Screenshot #7: The main screen of the ethernet data browser ETHSHOW.EXE. Screenshot #8a: An example of LANSTAT's screen layout. Screenshot #8b: An example of LANSTAT's screen layout. Screenshot #9: An example of LANSTAT's optional HTML output. Screenshot #10: The help screen of the network utility NTOOL.EXE. 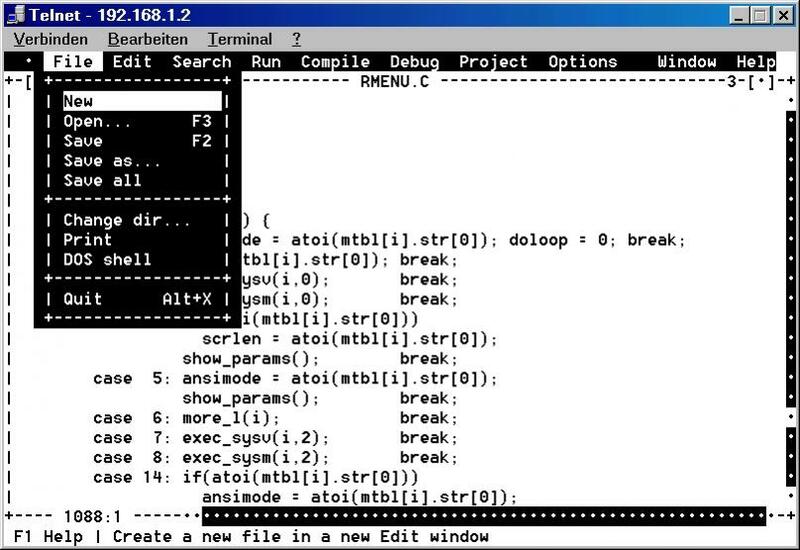 Screenshot #11: RMENU used to remotely edit its own source code in Borland C++, via the telnet client that came with Windows 98. 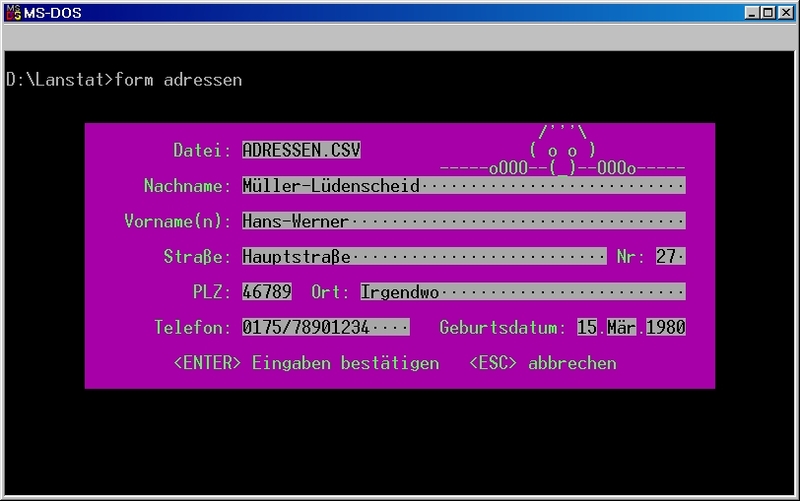 Screenshot #12: The same as above, but with PuTTY as the telnet client.